Sanford, Fla., police officer Chris Serino in Seminole circuit court, in Sanford, Fla., on Monday, July 1, 2013. The jury in the George Zimmerman trial heard his first accounts given to investigators of the deadly confrontation with Trayvon Martin when tapes of police interrogations were played in court Monday. The audio and video content had been made public before the trial, but this was the first time jurors heard Zimmerman – who has still not said whether he will testify during trial – tell his side of the story to police in his own words. One of the officers who questioned Zimmerman, lead investigator Chris Serino, testified that he tried to bluff Zimmerman into thinking the clash had been recorded to convince him that he would be in more trouble if he lied. “I believe his words were, ‘Thank God, I was hoping somebody would videotape it,’” Serino said. When questioned further, Serino said he thought Zimmerman was telling the truth and was not a pathological liar. 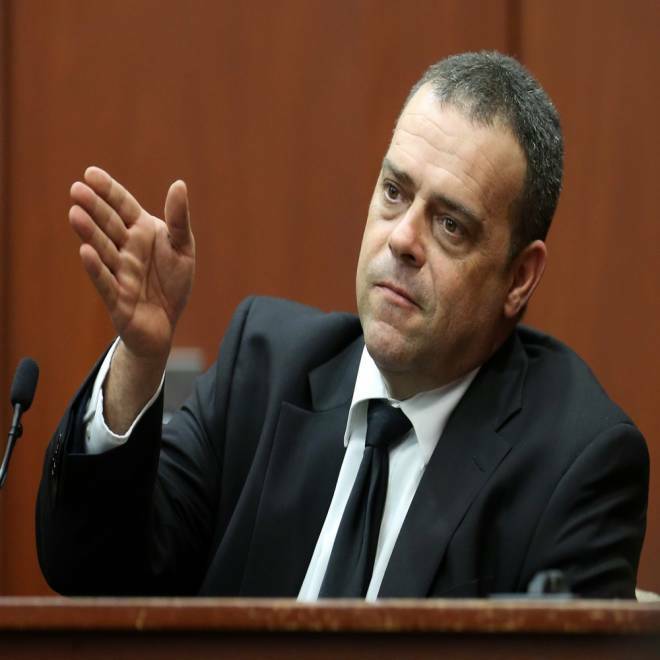 On Monday, the top two investigators who interviewed George Zimmerman took the stand, including the lead detective who had doubts about the story Zimmerman told police. Zimmerman has pleaded not guilty, saying he fired his gun in self-defense. NBC's Ron Mott reports. Zimmerman, 29, has pleaded not guilty to second-degree murder in the death of the unarmed 17-year-old, who was walking in the neighborhood watch volunteer’s gated neighborhood in Sanford, Florida. He says he shot Martin in self-defense after being attacked. Martin was unarmed. Serino testified that, while Zimmerman estimated he was hit some two dozen times, he considered the head injuries “minor.” But pressed on cross-examination, Serino also said life-threatening injuries are not a requirement for proving self-defense. Serino also testified that after Zimmerman heard a tape of a 911 call on which screaming can be heard, he said, “That doesn't even sound like me." Zimmerman had told cops he yelled for help, while the prosecution contends Martin was screaming. Also taking the stand was Sanford police officer Doris Singleton, who took the initial statement from Zimmerman at the police station after the Feb. 26, 2012, shooting. She recalled that at one point he noticed a small cross around her neck and asked if she was Catholic. She said she was Christian and asked him why it mattered.